When was the last time you had a peaceful, amazing nights rest, mama? 2 days days ago? One week? Or has it been months? Are you up in the middle of the night reading this article in search of ways to get your baby to sleep through the night (or even for 30 minutes)? Maybe you’ve just accepted what others have told you. “Don’t expect to get any good rest for MONTHS after you have your baby. It just comes with the territory of being a new mom.” I’m guessing you’ve heard that one before, right? I TOTALLY get it. I understand the longing for some good baby sleep tricks so you can finally get a good rest. Too often, sleep deprivation in new mothers is taken lightly by many people and sometimes even poked fun at. But the truth is, sleep deprivation which can lead to chronic exhaustion, has a horrendous effect on mothers. Us moms tend to strive to complete too many tasks and cover to many bases while neglecting ourselves. While we do plan to ‘get around to it’ eventually, we put ourselves and our family in jeopardy. The NHTSA (National Highway Safety Traffic Administration) for example, reported that drowsy driving killed 824 people in 2015 alone. They say the most accidents from this occur between the hours of midnight and 6am as well as in the late afternoon. I want you to be in the best health you possibly can, mama. And I know you do too! Your kiddo needs you. But if you’re looking for some natural sleep remedies because your sleeping habits are too fragmented, you can make some simple changes to help get you back on the right track. Hope at last! Here are 15 baby sleep tips to help YOU and baby get a better sleep. When my twins weren’t even a day old, the nurse came into my hospital room and showed me how to swaddle my baby. My husband actually picked swaddling up faster than me and became the swaddle whisperer! But if your baby rolls over, doesn’t like the constriction of a swaddle or is just too old (6 months or more), using a sleepsack is your saving grace for better sleep! They slept more soundly and for longer periods (and so did I!). When I say these sleepsacks were our saving grace – they were. We used the cotton sacks and the winter sacks for many years. In fact, they stopped wearing them once they were potty trained at around 3.5 years old (yes, these sacks come in bigger sizes too). So simple right? Yes, this is actually beneficial for you and baby. Try moderating the lighting in the room. If you turn down the light or turn them off completely it can make you feel tired and get your body ready to sleep. We also put a night light in the bathroom, which was across the hall. This helped us for night feedings (so we didn’t stub our toes). Sleep regressions usually have moms scratching their heads trying to pinpoint where they went wrong. You know you’re battling a sleep regression when all the things that did work to get your baby to sleep through the night no longer works. Your baby is more irritable and wakes up more during the night. If your baby hasn’t come to (or through) this phase yet, you need some tools in your arsenal to get you to the other side. Offer a pacifier if your baby takes one easily. For my twins, I sometimes just gave them a bottle as I found these sleep regressions tied closely to growth spurts so I figured my babies were just hungrier than normal! Get into a routine of appointed feeding times in the evening after a certain time. This can help with your baby sleeping through the night. For instance, you might do a feeding everyday at 6am, 9am, 12pm, 3pm, 6pm, 9pm and so on. Make sure that your baby is getting enough milk during each feeding. 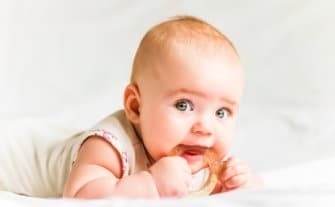 Blocking specific times for your baby to feed is not starving your child, it’s just helping your baby to work with their body to eat during certain times. Gradually your baby’s body will adapt to this new habit. To help you keep your milk supply during this time, check out my list of yummy lactation recipes! If you decide to co-sleep, you need to be safe! 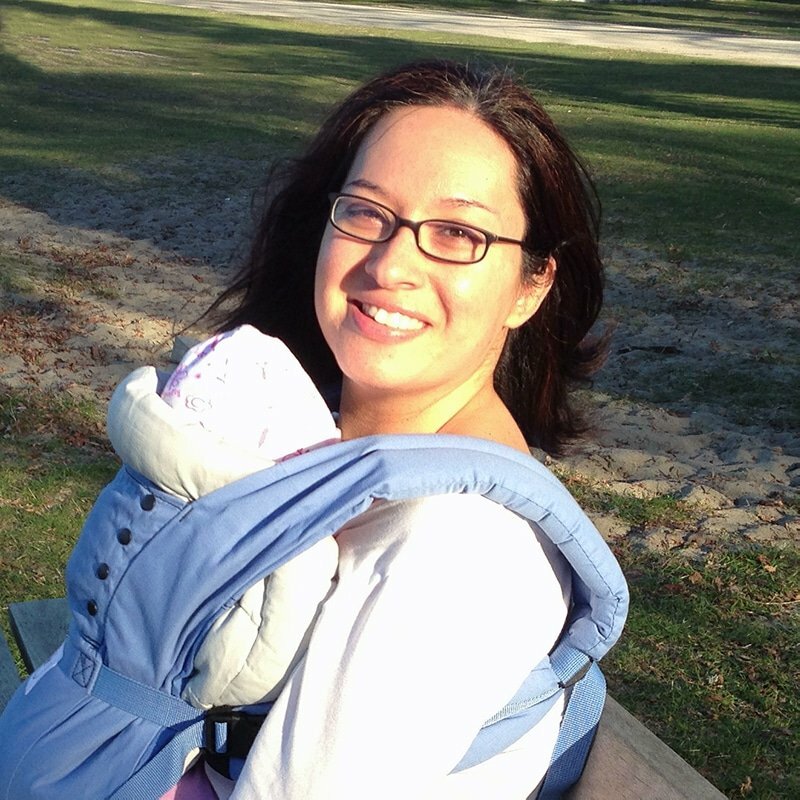 Using a Snuggle Me is the perfect way to have your baby co-sleep with you. It keeps them safe and secure and avoids any thoughts of rolling over your baby. In the same way that a bath is super soothing to adults and helps us to relax, it can do the same for your baby. You could also try giving her a massage and singing to her while you bathe her. Having a bath before bed consistently also cues your baby that sleep time is soon. I find being calm during bath is helpful. Even if you put a few drops of this oil can calm your baby quickly and get them ready for sleep. This is certainly a bit controversial. But you decide if this is right for you. While some believe a baby should be fed without hesitation or delay whenever they cry, others are sticklers for training a child from the time they’re a baby to nap during certain times. If you’re somewhere on the fence, you can try the schedule approach with the option of stopping at any time you want. Because I had twins, I adopted a strict feeding and sleeping schedule. I had my twins both eating and sleeping at the same time. I need free time to pump milk, do chores and prep their meals so I had to have them on the same schedule. I believe this helped in getting them to eventually sleep through the night. Use white noise in the background as you put your baby to sleep for naps or to bed at night. Over time, this will help them indicate that it’s time to sleep. I used a Sleep Sheep for my white noise. Put your baby to sleep at the same time each night whether baby seems sleepy or not. Going through the motions of putting baby to bed each night will help their body get in tune with this new sleep cycle. The key here is to be consistent. As your baby ages, make it a point to do stimulating activities with your baby throughout the day. Crawling, “tummy time,” playing, and other activities increase the likeliness that they’ll want to sleep later. Just remember, this is progressive and takes some getting used to, mama. But it can pay off in the weeks and months ahead. If you find that keeping your schedule is overwhelming, you can quit. It doesn’t work well for every mom and baby. On that note, the book Secrets of the Baby Whisperer: How to Calm, Connect, and Communicate With Your Baby has some excellent tips on how to get your baby to sleep on a schedule and how to discern your baby’s cry. Author Tracy Hogg also tears down the myth that mothers can never have sleep during the first year. It is possible! All babies are truly different and unique! 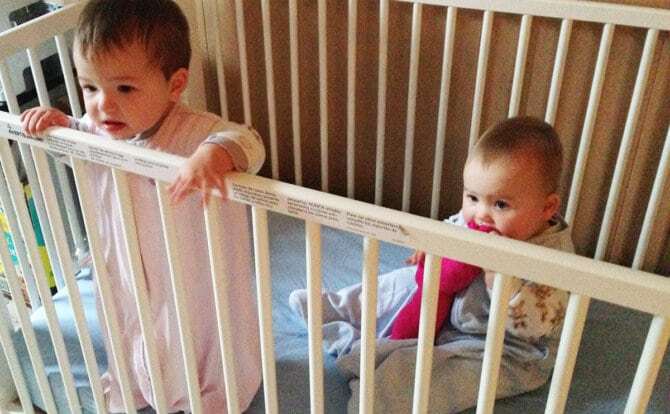 When they awake during the night, they don’t always necessarily want food or need their diaper changed. Funny thing, I know a mom whose daughter often woke up for 15-30 minute intervals at night between the hours of 3am and 5am just to coo and sing during the first 4 months after she was born. If you’re a light sleeper this one may be tough to ignore. Especially if you bed-share. But just knowing you don’t have to actually wake up to do something can help you get that quality sleep you need. And teaching your baby to self-soothe is so important as they age. Providing a luvey or stuffed toy or a favorite blanket can help your child self-soothe as well! It can wait! Don’t do housework when your baby is sleeping. Use that time to rest, even if you don’t feel sleepy. Take the rest because you know you need it. It’s easier (and better) to prevent burnout rather than trying to recover from it. This is something I didn’t always do! I was fortunate to have my mother-in-law help with laundry and my husband often helped with sterilizing bottles, so when my twins were napping I was able to pump and read, have lunch and do some light chores. This was a much needed break for me so if you can’t actually sleep when your baby is sleeping, read a book, have some tea and relax! Caring for your baby day and night is exhausting if you have no extra hands to help. If your husband can jump in to bear the load you should let him, mama. This means verbalizing specifically what he can do. Is it helping feed or change baby? Or does that mean both? If you’ve pumped breastmilk, could he warm the milk and take care of all the feedings throughout the night? There’s no shame in asking for help. Even in letting him know you haven’t slept well in days and you need the help badly. If your husband is unable to help, is there another family member who can lend an extra hand? Even if it’s just temporarily, this will allow you to replenish yourself and feel a whole lot better. I was fortunate to have my husband help me with night wakings. When my twins would wake up at the same time, my husband would feed one and I would feed the other. Or, my husband would change diapers while I warmed their milk. Once my twins were closer around 8 or 9 months, they started waking up a different times and I was the one doing the feedings and changings. Any help I got was greatly appreciative! Getting good rest each night is not an element of your life that stands alone. Several of your habits directly play into how well you sleep, mama. So what are they? The next two points can help you adopt a healthier lifestyle for better sleeping! Consuming foods like cabbage, broccoli, or spicy foods can cause gas and fussiness in your baby. You might want to avoid eating these foods (as they are transferred through breast milk) or feeding them to baby directly. As busy mommies, eating convenience foods is always a sore temptation. But if you really want to experience quality sleep, eating healthy is a must! Eating foods that are closest to their natural state are better. Skip the processed foods and look for ways to incorporate foods into your diet that are rich in nutrients. Limiting caffeine to no more than 2 cups a day is best when you’re breastfeeding as well. Studies show that women who drank chamomile tea for two weeks had lower levels of depression and improved their sleep quality. If you’re not a tea drinker, almonds – which are filled with magnesium – can also help improve your sleep quality! If you want to be able to sleep better, you must treat your body well mama. It’s recommended that you get at least 30 minutes of exercise on a daily basis. Taking care of the kids each day means you need to plan time to schedule…you in to your calendar. If you’re old fashioned and prefer to block out tasks in a paper planner, do it that way. If you like to use e-calendars, Google Calendar is a great tool. You can easily move tasks from day to day and from time-slot to time-slot in seconds. This can come in handy if you’re going to use the schedule approach. And, exercising is just one way to lose your baby weight mama! Here are 20 more ways to lose your baby weight! Generally, your baby should be dressed in one more layer of clothing than what you’re comfortable wearing in the same room. You’re baby’s body temperature should be anywhere from 97-100.3 degrees fahrenheit. The ARC InstaTemp thermometer is a non-touch device that reads your baby’s temperature quickly and accurately. It’s a nice tool to have on hand since you don’t have to worry about contamination, extra parts, and it can be done quickly. Just remember, if your baby is warm or comfortable they will do better and sleep through the night! If your baby has not been getting enough nutrients and you’ve been advised by your doctor to wake your baby for feedings, follow those instructions. But even under normal circumstances for example, let’s say your baby is napping a bit longer than usual and it’s getting into the evening. Rather than let her sleep, it may be better to wake her, change her diaper, and feed her so that she’s full enough to sleep through a good portion of the night. I’ve had my fare share of deciding if I should wake my twins. 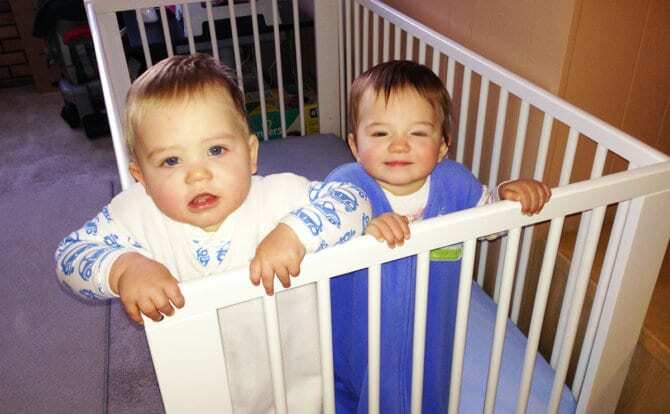 When they were in their first month, my doctor told me I had to feed them every three hours. I HAD to wake them up. But, once they were of proper weight and happy, I no longer woke them up every three hours (plus, I was dang tired by then!). 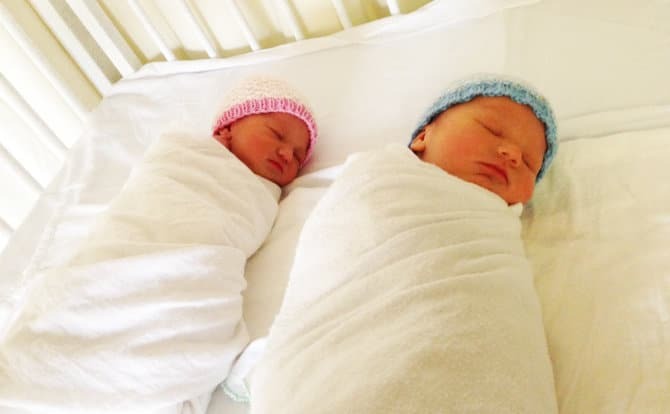 My twins were able to sleep 6 hours at night which was a blessing for me! As they grew up and had regular nap times, I had to decide if instead of three naps, they get two big naps or if their one nap lasted until dinner. I have awoken them up if it’s 5pm since they bed time was around 630pm. But, there were other times I didn’t. So, use your discretion! 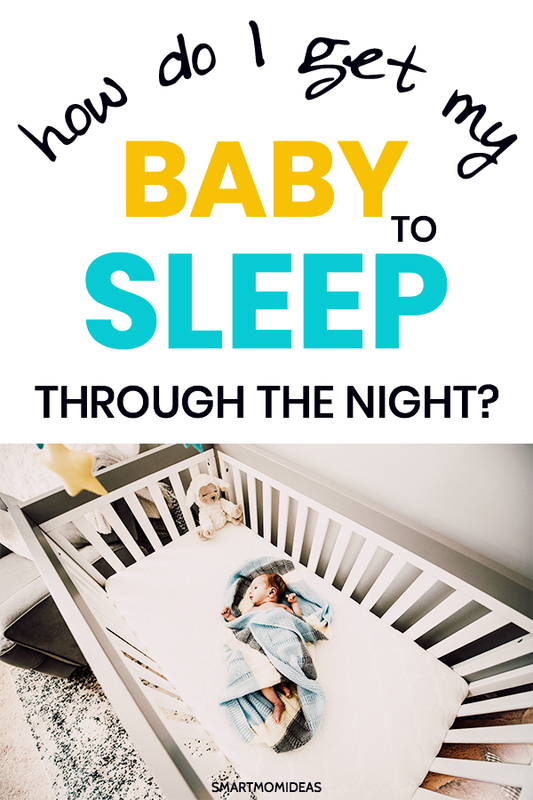 How Can I Get My Baby to Sleep In a Crib Or Bassinet? 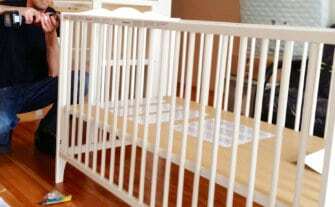 Some of the tips mentioned above are useful when your baby is not sleeping very well in their crib or bassinet. Likewise, singing to you baby, warming the bassinet, or having the linen smell like you may keep your baby calm enough to fall asleep. Try also standing over the bassinet for a few extra minutes so your baby can see you. If baby knows you’re placing him down and then leaving right way, the unrest can extend the time it takes to get him to sleep. A Good Night for Baby and Mama! Coming to the end of your rope is not fun, mama. You’ve endured what might have been a tough pregnancy and delivery. I want you to be well, happy, and have all the rest your body needs to be able to care for you and your precious family. 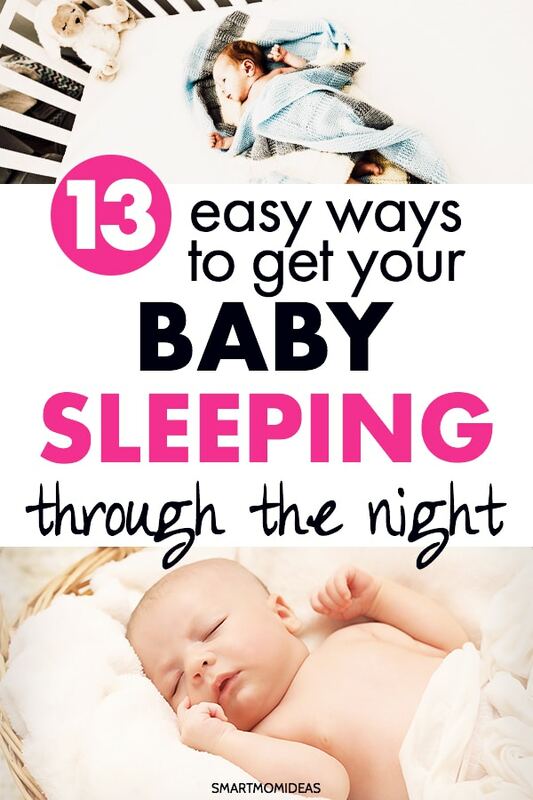 Give these tips a try and pretty soon you’ll have baby sleep through the night! Perhaps one, or a combination of a few may be all your baby needs to sleep well. Remember that this stage is only temporary. You’re doing such a great job. Don’t lose hope! Do you have any tips to share that I missed, mama? Don’t hold back, please share! We’d love to hear more creative ways mommies out there can get back in their sleeping groove. And, remember to pin me! 16 months later and I’m still trying to figure out how to get my baby to sleep through the night! We’ve been co-sleeping (safely) since she’s been born. When she would wake in the middle of the night, I’d automatically just nurse her back to sleep. I know that’s where I went wrong. I didn’t realize that her waking didn’t necessarily mean she was hungry. Now I’ve created a bad habit! Next time around I know what to do, come back and read this! Parenting is different for everyone. What works for me may not work for you! Do what works mama! You can do this! Sleep sacks are so much fun! I’ve had 3 of those (not that you need this many… I just really liked the idea and the design). I’ve followed Susan Ubran’s sleep training guide since the beggining, and she is pro-swaddling. My babygirl seems to enjoy it so I googled some more and switched to sacks. Easier to use and the effect is pretty much the same. If you prefer classics in Ubran’s book there is an instruction (http://parental-love.com/shop/baby-sleep-training ). There is also much more of useful tips!